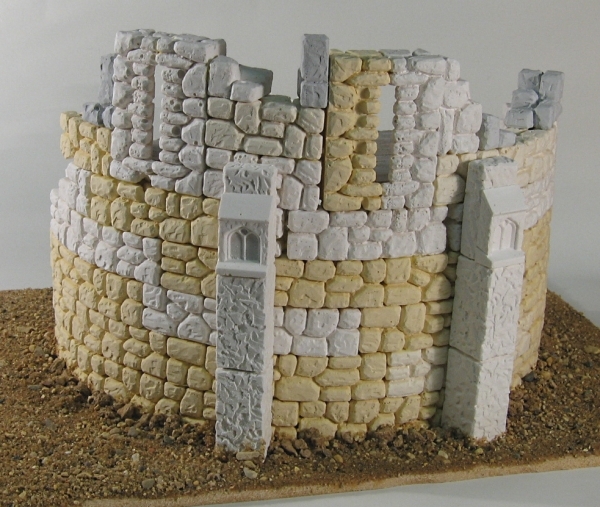 Terrain Putty is a two part resin marketed by Kraftmark as a terrain builder’s solution. The product is light weight and produces a dough like putty when mixed. Combining the resin and hardener is a messy job, frequently getting putty all over one’s fingers. The resin half is a bit “lumpy” and requires careful attention for a smoothly mix. The baking analogy continues with the combined product as the putty feels and acts in the fashion of a sugar cookie dough. The putty pushes and shapes very well, but has limited ability to pull or stretch. Water functions as a tool lubricant & smoothing agent. While working time is advertised as 2 hours, I had no opportunity to work the putty past 90 minutes. Sculpting: Terrain Putty did a fine job of taking and holding sculpted detail. The putty is very receptive to finger shaping and able to hold a respectable edge with little work. Care needs to be taken with the uncured putty, as it has little strength. Only after 24-48 hours does Terrain Putty develop its full durability. Patching: As a gap filling product for a resin kit, Terrain Putty does poorly. The lack of elasticity in the putty makes working a “sausage” into a gap a bit of a chore. Molding: Terrain Putty does take a texture stamp with some success, although the putty does leave residue on the stamp. 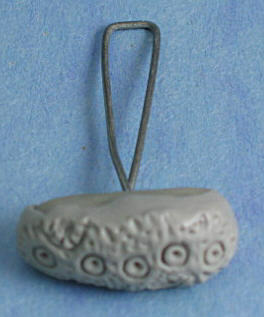 The putty can also be used as a casting material in an RTV mold (such as the Hirst Arts molds). Terrain Putty is adequate at taking detail & could be used as a substitute for a limited number of pieces if casting resin is not available. Over all I rate the product a B. The ultra small grain of the epoxy holds detail and takes compression molding very well. Finally, the price does seem a bit high when compared with other product s on the market. 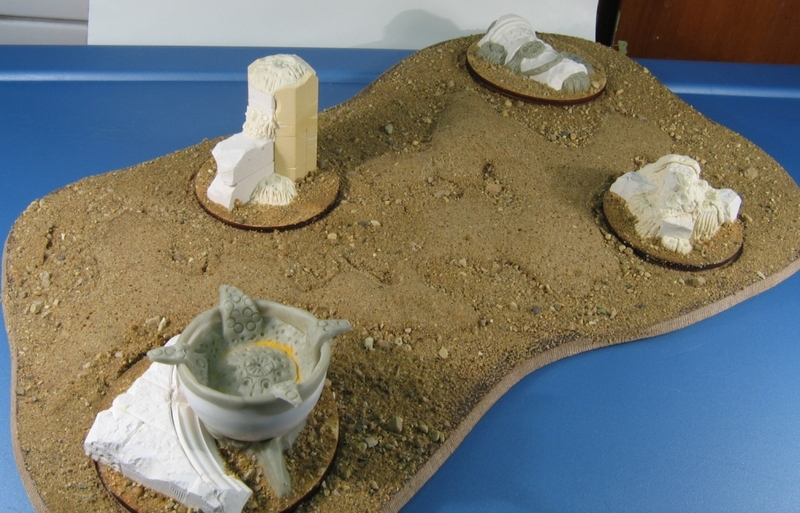 Project photos: Terrain Putty on the gaming table. The alien has arrived & its hungry. Prepare to be infested! 5th edition 40K brings strict line of sight to the terrain rules. The solution is area terrain with defined places for all objects. A 1/4 MDF board is drilled with sockets for 60mm and 40mm wooden disks. 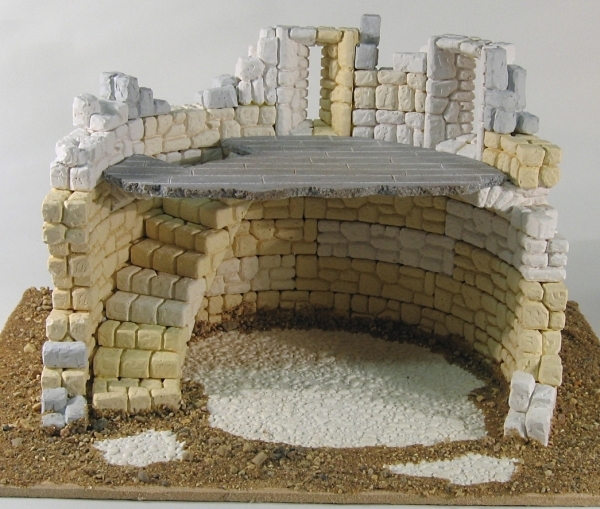 Look for this terrain system at the upcoming Adepticon convention. 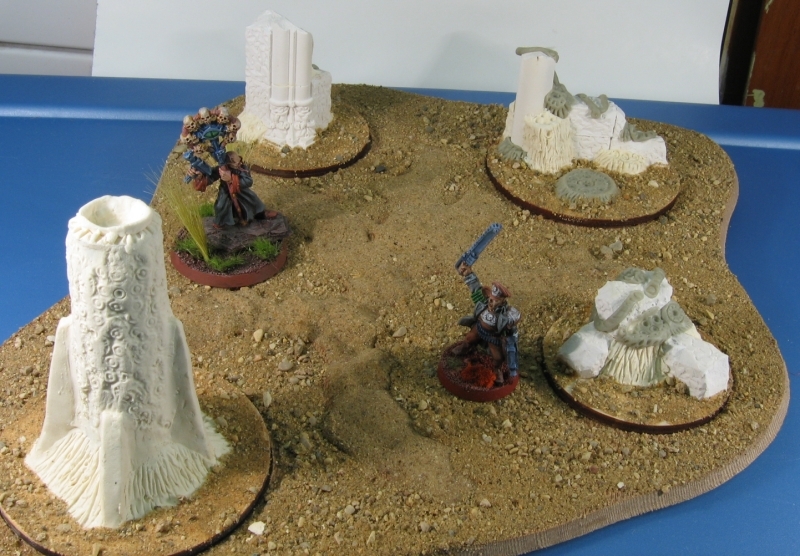 For these two terrain sets, each disk holds a mini-diorama built from Hirst Arts blocks, PVC pipe, a plastic Easter egg and lots of Terrain Putty (light tan) & Apoxie Sculpt (light gray) epoxy putty. In addition to standard sand flocking, the MDF board is also coated with a mix of play sand applied wet & saturated with white glue. The ridges represent underground tentacle growth from the infestation, hopefully the effect will be more noticeable once painted. First installment in a rather large project for Adepticon: a ruined pirate castle. The table will be used for the group Legend of the High Seas game on Friday and Saturday night. Plans for the rest of the castle include a second round tower, one or more square towers, a fallen main hall, a few grand facade and lots of jungle foliage. The ruined tower is built from Hirst blocks with a floor tile carve as the second floor and wall paper texturing the base. The open side and missing upper floors represent the damage done to the fort when sacked by the British navy – but in reality are a nod to playability, giving easy access to the structure. Favthumbs is a handy mashup site which displays a site thumb nail for each of your Delicious links. You don’t even need to have a Delicious account – the interface will display links from any user. Only draw back I see is a 100 thumb nail limit – but a little bit of tag browsing should get around that. Do you use Delicious? Link up your Favthumbs/Delicious account in the comments. March 12-2009: Favthumbs is gone. The owners were not able to support the site & have turned the address into an ad site. Too bad – I really liked the ability to see the bookmarks as thumbnails.